If you own a camcorder like HDC-TM700/HS700/SD700 (1080 60p/50p), Sony HDR-CX350, HDR-XR520, Canon HF S21/S200, JVC Everio GZ-HM1, which creating native 1080p AVCHD MTS or M2TS files, you may have recorded lots of family videos and party shootings that you’d like to view on HDTV or other big screen. Hooking up your camcorder to TV seems a good way yet you can’t have all HD footage on the cam – one can fill a 60 GB HD camera fairly quickly. Since anyone who does a lot of amateur video is likely to end up with plenty of long files with only a few short gems, this has a place in the arsenal of “disk cleanup” software to get rid of junk from your 1920 x 1080 HD recordings. If you like recording with your high definition AVCHD camcorder and enjoy sharing or streaming these raw video files on HDTV and Smart TV, the best solution is trim out unwanted clips and convert 1920 x 1080 HD MTS/M2TS/MOV/MXF/MOD/TOD video to streaming media format like MP4. In that sense TV Converter Ultimate would be good for beginners, because it offers both trim and convert solution in the easiest way. Amateurs and new hands would quickly get satisfying, if limited. Step 1: Load 1080i/1080p HD recordings to TV Converter. You can hook up the cam with PC/Mac for importing HD footage, or import the 1080p recordings from HDD backup. TV converter comes with a camera wizard that allows you to quickly transfer video from most cameras- including digital cameras (Canon Vixia, Panasonic Lumix), HDD based camcorders (Sony Handycam, Panasonic HD, JVC Everio, etc) and flash drive cameras – to computer HDD. You can click “Edit” go to edit window. You can do something for your video. Here, More editing power under the hood lets you edit and personalize video using classic features including cut, merge, crop, trim, rotate, add watermark, adjust duration, etc. Step 3: Select output format. Choose “Output Format” in the main interface to switch to Output window. Ultimate TV converter comes up with massive output formats (AVI, WMV, MKV, MPG, H.264, TS, MOV, MP4, etc). Here, you can choose “Format > HD > MP4”. This is a 720P HD profile. If you like, you can click “Settings” to choose 1920*1080 as output resolution. This resolution will spend more time on conversion. 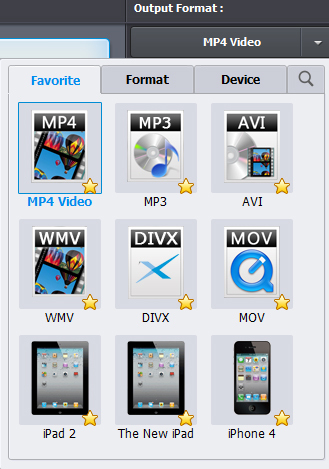 When converting MTS, MP4 and MOV videos into one file, you’re suggested to choose a desired format under “Favorite”. You can choose “MP4 Video”. There’s also a “Device” tab under which you can find hundreds of presets for almost all the tablets and smartphones to HD media players (NAS, WD TV, Popcorn NMT, etc) and video game console(Xbox 360, PS3, Wii). The best streaming media format is H.264 .mp4. Step 4: Convert 1920 x 1080 HD recordings to MP4. 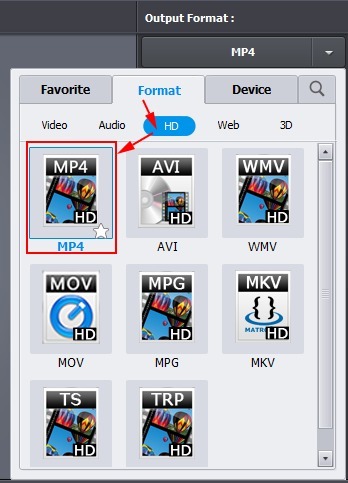 Click “Convert” icon to start recordings to MP4 conversion. Step 5: Watch HD recordings on HDTV/Smart TV. Basically most HDTV/Smart TV plays videos from flash drives. If your TV is in connection with home network, you can play the result short film from NAS device or have a PS3/Xbox 360 to stream the videos to HDTV/Smart TV. You can transfer the converted video to USB flasd drive, you can play it on HDTV/Smart TV via USB. With phones and digital still cameras all able to generate videos, often in HD, these days I expect a typical family is likely to have video footage in a wide variety of formats, all of which we might want to include in some videos. The ability to deal with a wide variety of input formats quickly and easily is a plus of TV Converter. Andrew Ensz on How to play AVCHD on Samsung LED/LCD/3D TV via USB? How to rip Blu-ray disc on Windows 10? Copyright © 2019 TV Converter. All Rights Reserved.